In April, just as WordPress 4.3 was beginning development, I started a conversation about WordPress, PHP7, and HHVM. Now that WordPress 4.3 has been released, I’m glad to say WordPress is looking great as far as PHP7 goes. I’m planning on spending some time during the 4.3 development cycle focused on these next generation platforms. The PHP core team did a solid job of not introducing many breaking changes with this release, which really helped to make the transition easier. The two major changes that WordPress needed to make in order to have passing unit tests on PHP7 were to deprecate PHP4 style constructors and updating some variable variables. 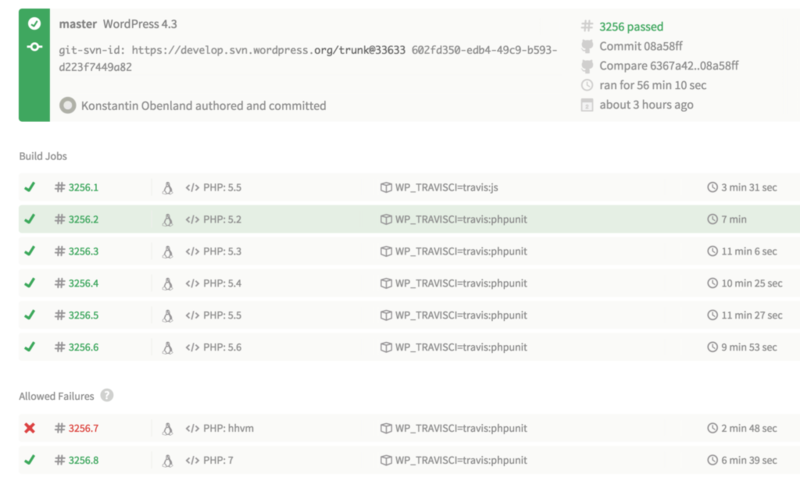 The final commit of WordPress 4.3 has PHP7 tests passing and running faster then any of the other PHP versions. In 4.4, I intend to continue to focus on PHP7. The release schedule targets Mid October 2015. I hope to move PHP7 out of the Allowed Failures bucket on Travis-CI the day it is released. Next up is getting the unit tests passing on HHVM. Onward! Thanks for your work getting WordPress 4.3 ready for PHP 7. With 4.3 working well on PHP 7, we (ServerPilot) were able to launch support for PHP 7 starting with 7.0 RC1.